The Chaos Space Marines Codex is definitely suffering from age. This is not to say it isn't a competitive codex, but instead it suffers from not having a variety of fun competitive lists. This is arguable, but I have personally found that the options each the areas of HQ, Elite, Fast Attack, and Heavy Support are limited, compared to what newer codices are offering. That said, I have tried putting together a list that deviates from the standard Plague Marine and Obliterator spam lists that so often appear on the net, and in my own lists. Unlike many of the new codices that have a plethora of HQ options that provide ways of enhancing the rest of their army, the Chaos Space Marine Codex only offers Fabius Bile as an HQ option that can enhance the potential of other units within the Codex. These enhancements come at a cost of +3 points per model, and limited to Chaos Space Marines, but its something and I decided to see if I could make something work. This list is fairly limited tactically. It has 3 Rhinos, 2 Predators, and a "Termicide" squad. The 2 Predators make for good light vehicle kill. The 2 Chaos Space Marine squads are Fearless, S5, I5, with 2 Meltaguns. Finally, Fabius Bile rides with a potentially aggressive Plague Marine unit with Meltaguns. Enemy Death Star units will give this list trouble. 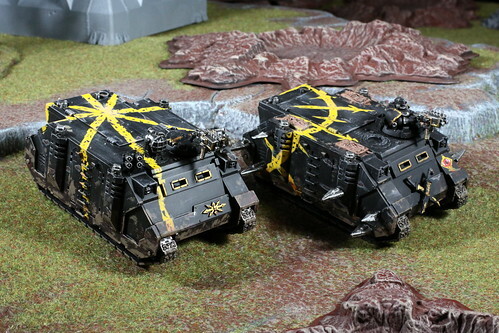 I also expect any army with a significant number of light vehicle kill will stall this army early game making it too slow forcing it to suffer heavy fire before entering its effective range. It has a chance, but I feel it will be hit or miss in many situations. Mostly more of the same. I added another Predator and a "Termicide" squad. I feel it might be troop light for 1750, and Sieze Ground, but I feel for 1750 I have invested enough points in troops, and any more might take aware from this lists ability to "kill" things. Going to 2000 points proved to be difficult. I was no longer happy running just 3 troop choices, but points really limited my options. Avoiding 2 small units of Plague Marines, in order to keep with my concept of avoiding my usually Plague Marine spam, I tried putting in 2 small units of enhanced Chaos Space Marines. This gives me a few more scoring options, but these units are a bit fragile and might give up points too easy in 2000 point games. I really need to reconsider how to bring this up to 2000 points, but that's the draft for now. 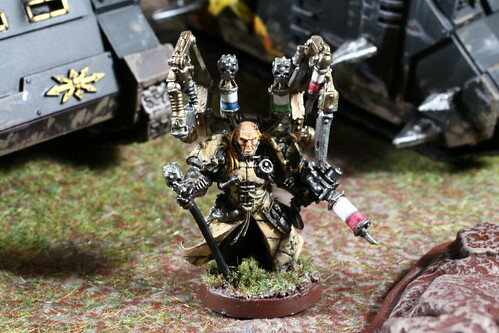 0 Response to "Army: Fabius Bile Themed List"